Be a part of raising awareness and support the Asperger's community with our Personalized Asperger's Awareness Shirt. This wonderful design features bright colors for joy and optimism and the puzzle pieces illustrate the complexity of this condition that has changed the lives of so many families. 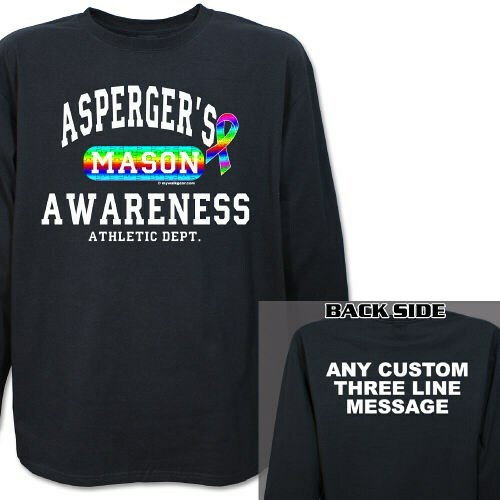 Show your support in every way possible each time you wear your new Personalized Asperger's Awareness Long Sleeve Shirt. Show your support for Asperger's today! Our beautiful Asperger's Awareness Shirt is available on our 100% cotton colored long sleeve shirts, machine washable in youth sizes S-L & adult sizes S-2XL. Includes FREE Personalization! Personalized your Autism Athletic Dept. Shirt with any name on the front and any three line custom message on the back. This shirt may or may not be personalized. Additional Info Wearing Personalized Autism & Asperger's Awareness Apparel, you are promoting acceptance and understanding of this awareness. Awareness Apparel is great for showing your support during awareness walks and raises awareness to those around you. You may also enjoy outfitting your entire Autism & Asperger's Walk Team with our Personalized Asperger's Support Key Chain and our Personalized Asperger's T-Shirt.